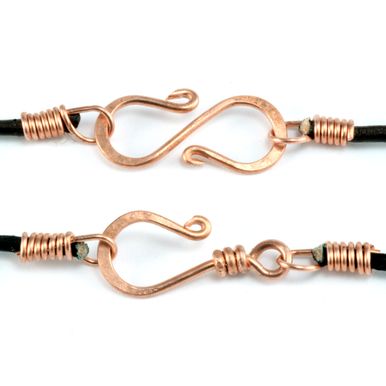 Tired of spending a bunch of money on premade earwires? Why bother when you can make them yourself to match any project. Join Lisa as she shows you how to perfect this technique. In this class you will learn to make a basic earwire and one embellished with a bead. Learn to harden the wire as well as file the tip of the wire for a more comfortable fit in the ear. You will also be introduced to great tools which are super useful for this project. 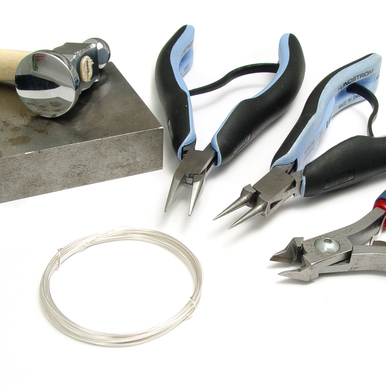 Wire Rounder Set - $12.00 - This is a set of 2 burs with a handle. 20g Sterling Silver, Round, Dead Soft Wire -1/2 oz (~9.5 ft) - $21.07 - You'll need 3 1/2 inches per pair, use 20 gauge copper wire for practice. Very good instruction - very clear and concise. Lisa explains in simple terms how to do something, and "why" a big plus in my book, as I retain information better, and longer when I know the reasons I am doing it this way or that. Like the end with the design ideas, so we can see how to combine different techniques learned in other classes. Another excellent video. The mandrel sizes -- 3mm section of round-nose, 5-6mm on round-nose, 10mm three-step barrel -- let us to use those measurements on other tools to create the same design. I usually use the six-step looper; this is the first time I've seen a good use for the three-step. Thank you for shining more light into the darkness! Also, thank you very much for the cup bur demonstration. I've been making jewelry for quite a while now, but ALWAYS enjoy watching Beaducation classes. I find that I always pick up new tips and techniques to incorporate into my own work. Lisa is just an outstanding teacher and I love her easy flowing manner and way of teaching classes. She makes it so easy to understand! Thank you Lisa and Beaducation. This class is really easy to follow and I have some new ear wires now. Thanks for the quick lesson on the sliding gauge as well. I was able to find things around my house when I didn't have the tools referrered to. I've been looking to make my own ear wires for quite some time, came by this site by accident on you tube. I must say Lisa is an awesome teacher! I've found many, MANY helpful videos, MANY!!! This ear wire video is so incredibly helpful. There are many products to choose from as well. Will most definitely be back for more instructions and items. Many thanks to Lisa and Beaducation for the time it takes to put all this together.